These odd looking pines, the first conifers met in ascending the Sierra from the west, creep into the forests of Yosemite on the lower, warmer slopes. Living in the hot foothills, mainly between 600 and 2000 feet elevation, they are decidedly unlike other pines in their open manner of growth, except the Knobcone and Single-leaf Pines. Most pines consist of one main trunk, or bole, surrounded by a conical mantle of foliage. Digger Pines, on the other hand, seldom have trunks that extend through to the crown, but instead, from five to twenty-five feet above the ground, the main trunk forks into two or more secondary trunks which diverge a bit and then shoot up, forming separate heads which collectively produce an irregularly rounded and open crown. From a distance these trees simulate the outline of an oak, but because of their translucent mist of gray foliage through which the ascending branches and cones are clearly visible, they can be recognized and readily identified with certainty. An additional characteristic aiding identification is their habit of frequently leaning away from the hillsides. Although unlike a pine in habit they nevertheless add a picturesque element to an otherwise quite monotonous landscape. The large, handsome cones are, like those of the Coulter Pine, among the heaviest of all the American pine cones. They are from six to thirteen inches long with a diameter of five to ten inches and may persist for several years attached to the stout branches by long stalks. The tips of the reddish-brown, or chocolate colored scales terminate in stout triangular hooks that project downward. The Digger Indians collected the cones and harvested large quantities of the hard-shelled seeds or pine nuts. This accounts for the name Digger Pine. In keeping with the scattered and sparse occurrence of the trees, the foliage is likewise extraordinarily meager and thin. John Muir in writing about it says, “No other tree of my acquaintance, so substantial in body, is in its foliage so thin and so pervious to the light. The sunbeams sift through even the leafiest trees with scarcely any interruption.” The leaves, of a peculiar grayish-green color, in bundles of three, are from eight to twelve inches in length and droop from the ends of erect pencil-like twigs. The trunks of full grown trees are from fifty to seventy-five feet high and from two to three feet in diameter. They are covered with dark grayish-brown rather thick bark that is deeply but broadly furrowed. Ring counts of sections of trunks show they are comparatively short lived. According to Sudworth trees from twenty to twenty-four inches in diameter range from forty to fifty years in age. Individual trees may be found considerably older. They have been known to attain the age of 175 years. With the exception of the Single-leaf Pine and the Knobcone Pine, the Digger Pine is the least extensive in area of any of the pines within the park. In the deep Merced canyon they grow sparsely from the western boundary to elevations of 3000 feet at Arch Rock. Near Wawona a few trees occur at the 5000-foot elevation marker just below the road. In the Hetch Hetchy region they find a more suitable habitat and grow rather abundantly. Here they have struggled upward on the sides of the canyon to an elevation of 6000 feet. 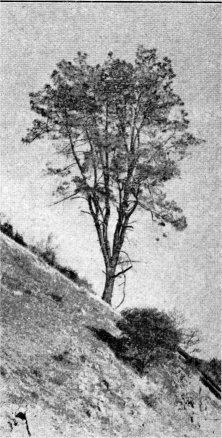 This, the highest reported occurrence or the Digger Pine, is on the ridge just south of Tiltill Valley associated with Yosemite’s one grove of Single-leaf Pines. The Digger Pine is restricted to California where it is found in the roast Range as well as the Sierra. Practically nowhere does it form a forest but grows singly or in small groups that are well scattered over the foothills. They appear equally at home whether growing with oaks, rising above chaparral or standing on steep grass covered canyon walls. Occasionally, they are found associated with Western Yellow Pines which inhabit the cooler bottoms of the canyons. Normally, however, the Digger Pine is the only conifer found in the dry, hot foothills below the main forest belt.